Henderson Water Utility CSO Long Term Control Plan Wins Outstanding Overflow Abatement Project Award - Strand Associates, Inc. The CSO Long-Term Control Plan for Henderson Water Utility was selected as the Outstanding Overflow Abatement Project Award by the Watershed Committee of the Kentucky-Tennessee Water Environment Association. The award was presented on Tuesday, July 10th at the Kentucky-Tennessee Water Professionals Conference in Nashville, TN. 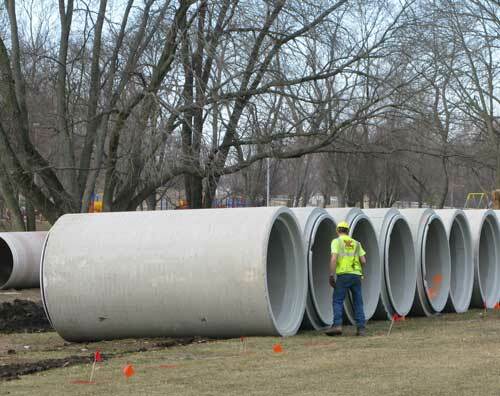 The first City in Kentucky to complete a mandated program to drastically reduce combined sewer overflows (CSOs), Henderson Water Utility (HWU), is proud of the significant forward progress made to protect its citizens and the environment. In February 2018, the 10-year, $41.2 million CSO Long-Term Control Plan (LTCP) was completed ahead of schedule. How successful was the project? During design, modeling predicted that HWU would capture 91 percent of the flow collected in the CSS during rain events for treatment, well above the 85 percent threshold established by the CSO LTCP guidance. Current measurements show that the system is performing as expected, even under higher rainfall totals. The community and business owners now enjoy the downtown area under all weather conditions.